Our aim here is to analyze in brief the recent Tekel worker struggles in Turkey at the level of national economy. The Tekel strikes which began on 15 December 2009 and ended on 26 May 2010 was the result of an ongoing privatization process which had been in effect since 1980.1 In 1999, through “an IMF restructuring program, privatization continued at a more accelerated pace and came to a peak through the application of Article 4/C, of Law No. 657 enacted by the ruling Justice and Development Party (AKP).”2 What started out as demands by the Tekel workers grew into strikes as the AKP government rejected any concessions. In taking such a firm stance as the government had, the strikes multiplied in their participation as well as intensity, which culminated into forming a brief tent commune in the middle of Ankara, the capital of Turkey. Police and other security forces were eventually dispatched to quell the striking workers, whose violent confrontation led a few of the workers to question the nature of the police in a class society.3 These strikes were important in the sense that contrary to the prevailing Huntingtonian paradigm, which asserts that the dominant conflict in contemporary society is based upon cultural and religious divisions, such a paradigm is inefficient in explaining one of the largest strikes in modern Turkish labor history. In Turkey, where the working class is deeply divided4 along such lines, the Tekel workers managed to overcome these internal divisions when confronted with unfavorable changes in the existing material conditions. The results of the strikes resulted in little material gains however, as the work period was extended from 10 to 11 months and their salaries increased by about 80 Lira.20 The most significant victory by the workers was the application of Article 4/C to the Constitutional Court, the highest judicial authority in Turkey. Today, the struggles have formally ended, yet the outcome of this court trial could trigger further protests if the demands of the workers are not satisfied. 1. On 12 September 1980, a CIA-backed right-wing military coup led by General Kenan Evren overthrew the existing government and began the process of privatization of state-owned manufacturing facilities in Turkey. 2. Erinç Yeldan, “Awakening of the Proletariat in Turkey,” Sendika.org 30 January 2010. 16 August 2010. 3. In one revealing part of a group interview conducted by Express magazine, two of the workers said the following: Fadıl Elçi: “The police attacked us with [tear] gas, but the blame should be put on those who gave the order. Except the police officer is also part of the people. If he were to disobey [orders] they would fire him.” Ramazan Ercan: “Fadıl, besides the rich man’s son would never be part of the police. But the police who had come forgot their class.” “Sömürgelerdeki köleler gibiyiz,” Express 01-15 January 2010, Issue No. 1: 19. 4. Turkey is divided along two broad ethnic and confessional lines, which are Turks v. Kurds and Sunni Islam v. Alevism. 5. Stanford J. Shaw, History of the Ottoman Empire and Turkey: Volume II, Reform, Revolution and Republic: The Rise of Modern Turkey 1808-1975 (Cambridge: Cambridge University Press, 1977), 506; 233. 8. Ibid. Yeldan notes that the produced stocks of the plants which had been sold were valued at $126 million. 10. Ali Berat Meric and Thomas Mulier, “BAT bids $1.72 billion to Win Turkey’s Tekel Auction,” Turkishjournal.com, 22 February 2008. 16 August 2010. 11. İzgi Güngör, “Turkish experts divided over Tekel privatization dispute,” Hurriyet Daily News and Economic Review, 1 February 2010. 16 August 2010. 12. Tolga Korut, “Tekel Workers Have Final Say for End of Resistance,” Bağımsız İletişim Ağı (BIAnet.org), 24 January 2010, 16 August 2010. 13. “Ağaç bile kaderine hükmetmeye çalışır,” Express 01-15 January 2010, Issue No. 1: 17. 14. “Boş boş oturuyorlar” in Turkish. 15. 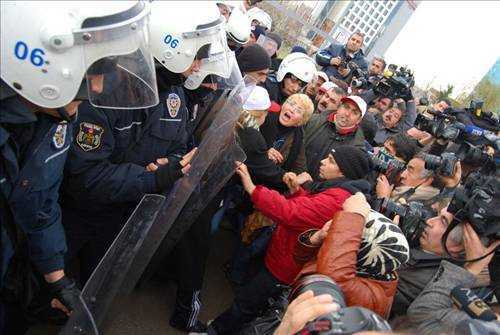 “Polis tekel işçilerini göle doktu,” Taraf, 18 December 2010, 24 August 2010. 16. Sungur Savran, “The Tekel Strike in Turkey,” Center for Research on Globalization (Globalresearch.ca), 17 March 2010, 22 August 2010. 19. “Tekel işçileri Türk-İş’i işgal etti,” CNNTürk, 25 May 2010, 6 August 2010. 20. Labor activist Yunus Öztürk, telephone interview regarding on Article 4/C of Law No. 657. 16 August 2010. 21. “Sömürgelerdeki köleler gibiyiz,” Express, 19.